The fix may come to you. Sometimes as writers, we get too deep into the story to see it clearly. Coming at the story fresh, plot and character problems are much more visible. One word of warning, though. Fix these problems quickly, while you still have that new frame of reference. It disappears fast, and you can find yourself back where you started, stuck in the mire. The market changes. Genre popularity changes. One season historicals are all the rage, while the next, it’s paranormals. 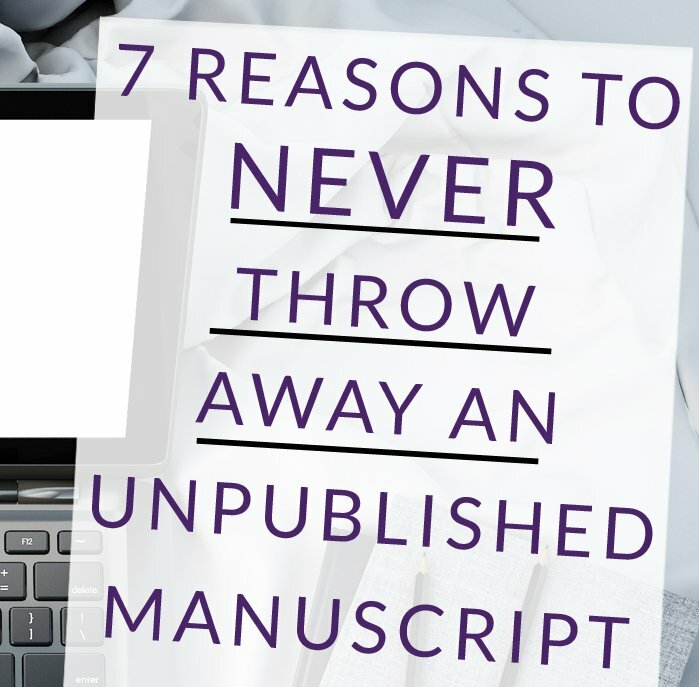 Your manuscript might be an amazing story, but the timing was just wrong. When reader preferences shift, you’ll be in a great position to strike while the iron is hot. The industry changes. Just look back over the past twenty years, and you can see how radically the world of books has evolved. Authors used to have a limited number of publishing houses with which they could work to get their stories into the marketplace. Over time, smaller boutique publishers rose. Then there was the advent of the e-book. Who knows what advances the future holds, but one thing remains true. Make sure you’re putting out a high-quality product. You shouldn’t self-publish an old manuscript just because you can. Make sure it’s the best that it can be, or readers will not react well. They want – and deserve – great stories. You may be able to cannibalize it. Your story may be unsalvageable, but there could be scenes that shine. Could those parts be re-crafted into novellas or short stories? I was able to do just that when an editor asked me to submit a short story for an anthology. I had a scene in an old manuscript that I loved. I crafted a new beginning, edited in the right motivation, and wrapped it up in a completely different ending. My editor loved the story, and I rescued nearly five thousand words by doing this. Be careful when using this approach, though. Make sure you don’t piece together a patchwork quilt. Everything needs to fit. Make sure the tone matches, the characters stay in character, and that readers won’t be jarred by any inconsistencies. Also make sure that you can live with cutting your story into pieces. Will it break your heart to do this? Maybe it’s not worth it. On the other hand, maybe publishing a shorter piece of work is better than publishing nothing at all. Only you, as the author, can make that decision. You may be able to use it for something different. Maybe your manuscript has flaws. Maybe the story is a mishmash of genres, but your character development is impeccable. These “drawbacks” might make your story a perfect case study for a workshop or writing class that you decide to teach. Show your writing chapter how you fixed the problems or give them to new writers as a writing exercise. Use scenes for a writing fundamentals blog. Be creative. There are lots of things you can do. It may give you perspective. Going back and looking at something you wrote a long time ago can lift your spirits. You can see how far you’ve come and how your skills have improved. Conversely, it can take you back to a time when you wrote just for the joy of writing. It can remind you that the story is king and that all the business stresses trying to throw you off track mean nothing. It may never go anywhere. That’s okay. Keep it because it’s your creation, and you love it. My latest release, Haunted Hearts, is one of those stories that finally found success after living in an unopened folder on my computer for years. I originally finished writing the manuscript in 2002. I submitted it to various agents and editors from 2002 to 2008. The feedback I received was all over the place. One editor requested changes and asked me to resubmit. It sat on her desk for a year until I asked her for a final decision. She took it to her senior editor who loved it, but decided not to pursue it because of another book they had in the works with a similar plot. The conflicting feedback left the manuscript a mess, and I finally set the story aside. Every few years, I’d pull it out and tinker with it, but didn’t have much success. I’d either get lost in the fog again or other projects would rise to take priority. This year when I read through it, though, something different happened. I saw how to fix it, and I put in the effort to make that happen. (See #1) I worked with an editor, and I had a cover designed, because I had a new avenue to get the story out there for readers – self-publishing. (See #3) I could have tried to market it to publishers again, but the story had gone through enough iterations. I had finally crafted it into the story I wanted to tell. (See #6) Finally, it’s the season of Halloween, the perfect time for a ghost story. (See #2) It’s time to let this story fly.